For each show, Gas commissions an artist to produce a fundraising edition that helps cover the essential costs of exhibition production. Editions are always affordably priced in order to remain accessible. In conjunction with the exhibition of Common Survival, The Institute of Queer Ecology produced an unarchival print entitled to plant an anxious garden of big dreams. The print, which is laser-printed onto seed paper, is a digital collage, with the base picture appropriated from the cover of the Fourth National Climate Assessment, published by the U.S. Global Change Research Program in November 2018. 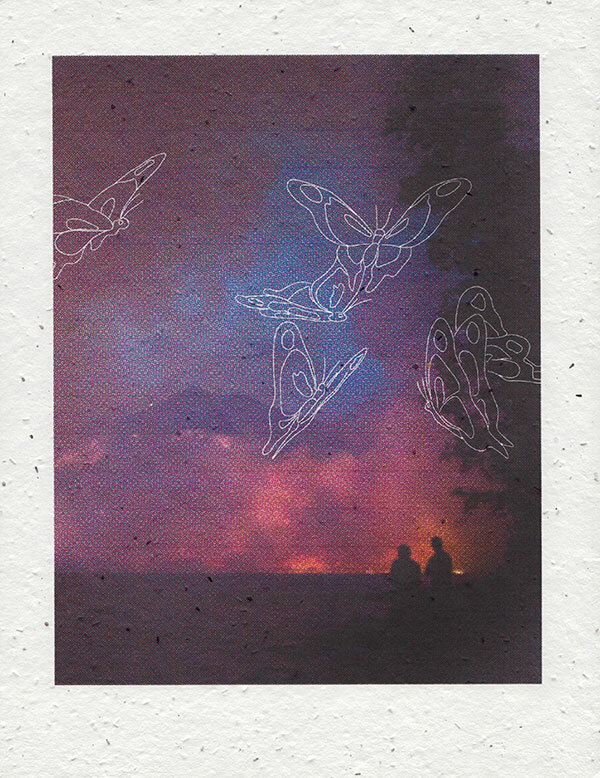 Overlaid onto it is a vector drawing based on a swarm of butterflies from Princess Mononoke (1997). Splicing together these images from very different sources, IQECO examines how “nature imagery” is deployed to elicit emotional response, and they play the images against each other here to create a new image that prioritizes silence and stillness, making space for contemplation. The print is unarchival, and should be planted under about an inch of soil and kept moist during germination. The seed paper it is printed on contains Bird’s Eye, Clarkia, Black Eyed Susan, Sweet Alyssum, English Daisy, Catchfly and Snapdragon seeds. By receiving this art object, you are entering into a contract with it to provide for a small plot of flowers, maintaining the health of the plants, pollinators, yourself and others. 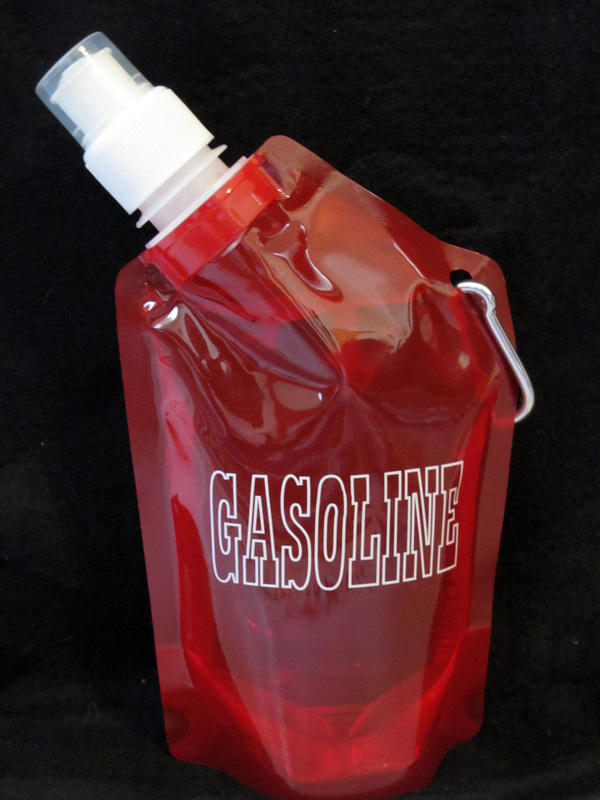 Limited edition water bottle emblazoned with an intentionally misleading logo stating its contents as “Gasoline” by artists Susanna Battin and Kate Kendall. The edition is as part of their larger piece Gas-for-Water (2018) that addresses oil’s value through trade through storytelling, performance, and drawing. The project began on a road trip from Lake Mead in Nevada to Los Angeles during California’s extreme drought. It imagines the plight of “meadmaids,” or mermaids whose livelihood is dependent on the lake, formed in 1936 when the Hoover Dam was completed. Set in a dystopian future where gas is plentiful but fresh water is scarce, the meadmaids exchange one for the other as they journey back to the lake and replenish its holdings. Artist Ian James pivots toward a near future in order to envision how market forces collide with an understanding of well-being. This car air freshener is part of a suite of new commissions for take care, that serve as a mini-campaign obliquely advertising imaginary products. Applying techniques of commercial photography, and channeling the desires imbued in such glossy images, the artist uses depth, surface, and shape to twist each composition’s implicit message of health, spiritual awakening, or renewal. James reveals the malleability of such messages, as well as our own aspirations. Using the same printing techniques as movie posters or advertisements, and structured like a “how to” guide similar to many listicles online, under the header “How to Survive Romantic Love” the poster provides tips for the modern-day lover. Michelle Pfeiffer’s Catwoman, an emblem of gender, sexuality, vengeance, and power, is in the background. The text considers the historical and social construction of “romance” with an understanding of the climactic urges and apocalyptic fantasies tied to the acceleration of culture and production. Referencing the 1975 novel Women as Lovers by Elfriede Jelinek, Benedetto places women squarely at the center of an impossible equation in which no human can survive. Bumper sticker created by Los Angeles artist Roy Martinez. Put it on your car, skateboard, stroller, etc.